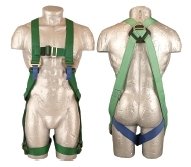 Single Point Harness complete with a dorsal (rear 'D') attachment point. Suitable for general work application where there is a risk falling. Chest Size: AB10 SML - Small - 34"- 37", AB10 STD - Standard - 38"- 44" and AB10 XL - Large - 45" - 54"